Do you have a thirst for adventure? Is your middle name danger? Do you just like treasure? Form a party of adventurers to help you be victorious! The more members of each class you have, the greater the bonus they’ll give you—but be careful; your opponents might try to poach your party members! In Guildhall: Fantasy, 2-4 players compete to create the perfect party by recruiting adventurers into their guildhall chapters. Collect sets of cards with unique abilities to control the table, and complete a full chapter to claim victory cards. Will you go for points quickly, or build up your special powers? Which will lead to ultimate victory? Only you know! The three releases in the Guildhall Fantasy line are all stand-alone games that can be played individually. You can also combine the cards from any of the Guildhall Fantasy releases and play them together. The three releases are not expansions, they’re combinable. This set contains the following proefession cards: Assassin, Marshall, Psion, Shaman, Spellblade, and Wizard. 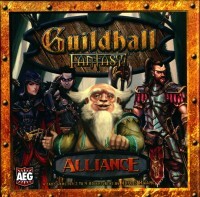 Add a Review for "Guildhall Fantasy: Alliance"